It is the first day of fall so i’m bringing you a great fall recipe! Fall brings so many great things especially to the food world. Soups, stews, comfort food galore, apples and pumpkin, yes pumpkin! We love pumpkin in our house and while I keep pumpkin in my pantry year round there is just something about eating it during the fall and it appears i’m not the only person who thinks that either. Other than Starbucks Pumpkin Spice Latte have you been to a grocery store and have seen all the pumpkin spice goodies they have now? It can be a bit overwhelming but at the same time really tasty. While the world is on pumpkin spice overload there are still a few things that have not found a pumpkin spice version so I decided to make my own. My kid’s and I are addicted to granola. While it is easy to make I kept picking up bags of our favorite brand and it was devoured in no time at all. So I decided to save my $4 a bag and make my own, pumpkin spice flavored of course and it was delicious! 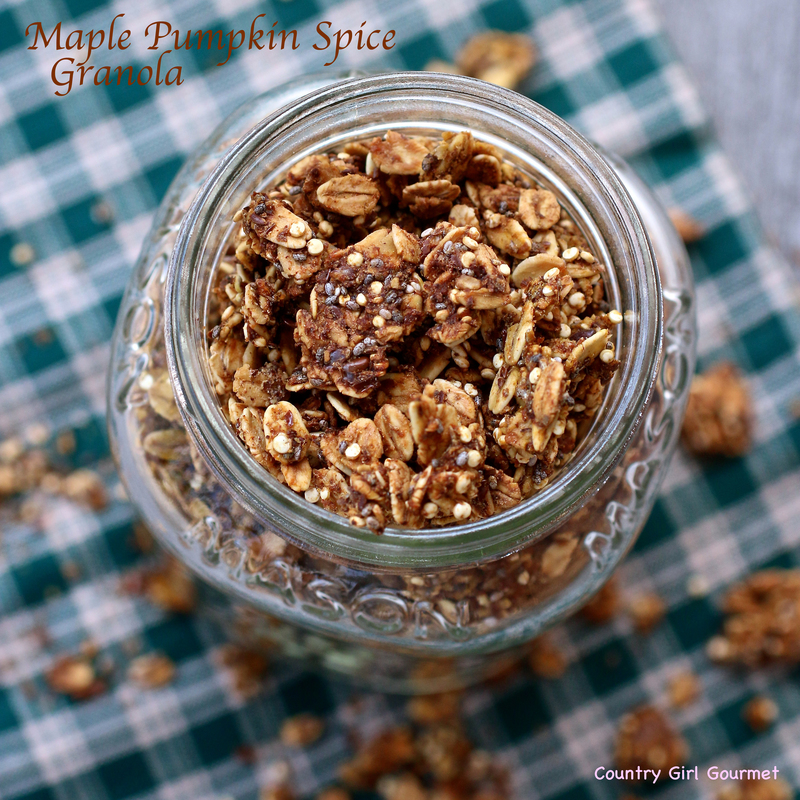 If you like granola and pumpkin spice this is the granola for you! Plus I added all sorts of other goodies to it like quinoa and chia seeds to add to the nutrition factor. Just don’t tell my kids that it is healthy. optional add in’s include your favorite nuts (such as pecans, almonds, pumpkin seeds etc.) and dried fruit (such as craisens and dried cherries). I have a kid in braces so I leave these things out. Preheat the oven to 300 degrees . Line a large baking sheet with parchment or aluminum foil. Combine the oats, ground flax seed, quinoa, chia seed and nuts (if you are including them) in a large bowl. Stir in pumpkin puree, maple syrup, honey, oil, cinnamon, nutmeg,cloves,salt and vanilla in a saucepan and coat oat mixture well. Spread the mixture out evenly on the baking sheets. Bake for 1 hour in the preheated oven, stirring at 30 minutes. Due to differences in ovens bake until toasted and crispy. Let cool completely before storing in an airtight container. Dried fruit can be added once the granola has completely cooled also. YUM! This looks AMAZING! Since it’s finally fall here (at least for today!) I might have to make this:) Thank you! I hope you do! My kid’s love this granola. Plus as an added bonus when you make it your house smells amazing! This looks liek a really quick and easy fall snack! I noticed in the instructions, but not in the ingredients, you mention adding honey and nuts. How much. also in the instructions you mention a saucepan what is that for.